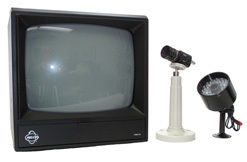 The FIND-R-SCOPE 85201 Includes a Miniature IR Camera, 12" B/W monitor, IR Light Source,16 mm, f/1.4 Lens, 50-ft. Coax Cable and mounting bracket. System has a spectral sensitivity of 400-1250 nm. The FIND-R-SCOPE 85201P Includes a Miniature IR Camera, 12" B/W monitor, IR Light Source,16 mm, f/1.4 Lens, 50-ft. Coax Cable and mounting bracket. System has a spectral sensitivity of 400-1250 nm.